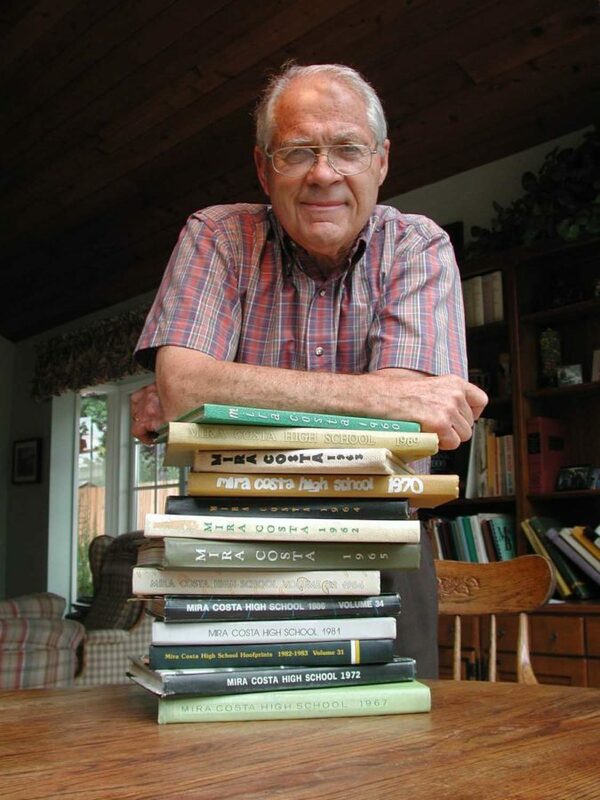 Bob Brigham began teaching at Mira Costa High School in 1951, one year after the school opened. Over the next 36 years, he taught history, government, social studies, psychology, typing and driver’s ed. He was also a counselor, sports announcer, and football, tennis, swimming and wrestling coach. Brigham passed away March 13, in Paso Robles, where he moved in 2005, after having lived in Manhattan Beach since 1939, when he was 12 years old. He was two weeks short of his 92nd birthday. A few years later, male students were disciplined for wearing long hair. Kendra Fleagle Gorlisky, the school newspaper editor, was warned by an administrator not to write a story defending the long-haired students. “Their ideas could tear down the school. Consider the source,” she recalled the administrator telling her. She went to Brigham for advice. “Don’t just consider the source. Consider the truth. Is there anything valid in what the long-haired students have to say,” he told her. Brigham showed a similar willingness to look past public opinion during the McMartin Preschool molestation trials in the 1980s. Among the accused was Mira Costa football player Michael Ruby, who worked after school at the Manhattan Ranch Preschool. During his month-long trial at the Torrance Courthouse, Brigham was the only Mira Costa teacher and one of the few Manhattan Beach residents to attend the trial and express support for Ruby, who was acquitted. Brigham’s interest in social justice began in high school when he noticed an undeveloped block of prime, oceanfront property between 25th and 26th streets in Manhattan Beach. “It was filled with weeds, cigarette butts, trash, and litter. I would ask old-timers about it and just get winks and nods and answers like, ‘You don’t want to know.’” he said in the 2002 Easy Reader interview. The property, Brigham learned, had been purchased in 1912 by Willa and Bernard Bruce, a black couple. They built a bathhouse, restaurant, and cottages to serve bathers at the Blacks Only beach in front of their property. Following a decade of harassment, Manhattan Beach condemned the property for a park. When the park was finally built in 1974, no mention of its Black history was made at the dedication. It was named Parque Cuiliacan in honor Manhattan’s sister city in Mexico. The city finally acknowledged the park’s history in 2006 by renaming it Bruce’s Park. Brigham was student body president at Redondo Union High School and co-captain of the football team. In 1943, he helped lead the Sea Hawks to their only CIF football Championship. He also ran track and set a school long jump record of 18-feet-6-inches. Despite his modest size, he played football all four years at Fresno State and boxed. Following retirement, Brigham and former Mira Costa Principal Carl Fisher, despite occupying opposite ends of the political spectrum, used Fisher’s key to Mira Costa’s old indoor pool to swim laps every morning. In 2005, Brigham and his wife Mary Ann sold their Manhattan Beach home for $1 million to help fund their grandchildren’s college education. They moved to Paso Robles, where he continued to swim, run and play golf daily. He swam 80 laps on his 80th birthday. Brigham is survived by Mary Ann, his wife of 66 years; children Leslie Moss and husband Rick of Paso Robles; Matt Brigham and husband Juan Gonzalez of Long Beach, and Allison Finkle and husband Peter of Chico, and by grandchildren Whitney Moss (Ryan Currier), Emily Moss, Jacob Moss (Leah), Spencer Finkle (Katie) and great-grandchildren Julian, Scarlett, Jaxon, and Laurel. A celebration of Brigham’s life will be held Sunday, May 26 at 2 p.m. in the Community Center of Traditions at River Oaks. The family asks that donations in Brigham’s honor be made to the ACLU (action.aclu.org) or First Tee (thefirstteecentralcoast.org), which teaches golf to children.